Want a modular flashgun that looks like a desk lamp? After much hype, Hink has finally unveiled the Spacefish. After much hype, UK manufacturer Hink has finally unveiled its “Spacefish” flashgun. The product features a small conical head and a long, flexible neck. The hotshoe-mountable base unit houses the battery and control panel. This radical design, like a high-tech desk lamp, is dramatically different to conventional flashguns, which have taken on either the “hammerhead” or “potato-masher” form factors for decades. “The neck gives the feel of almost endless manoeuvrability when using a flashgun creatively,” Hink said. Modularity, as hinted at in our earlier interview, is the name of the game. Hink have achieved this by including a standard micro-USB port on the base. 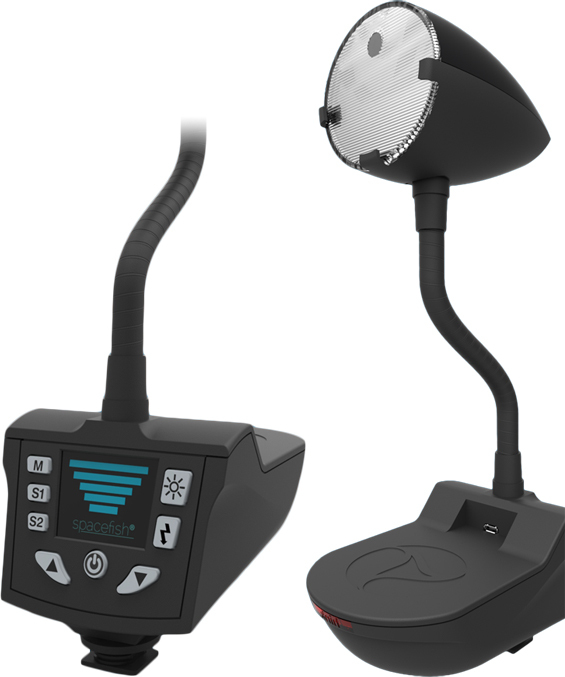 To this users may connect optional accessories including wireless triggers, Bluetooth adapters and auxiliary battery packs. These extra widgets are to go on sale “shortly after launch”, we are promised. Plastic colour correction filters can also be slotted in front. The company said the Spacefish has power “rivalling” that of high-end flashguns, but has not published raw data. The built-in lithium battery is claimed to provide more capacity than eight AAs. Other key features include an optical slave trigger and a colour LCD. For further information visit the Hink web site. What do you think? Would you buy something like this?